Numerous risk factors for preeclampsia have been proposed. Immunological maladaptation is one of the known risk factors, because epidemiological evidence supports a relationship between preeclampsia and inadequate tolerance. Regulatory T (Treg) cells play a central role in the induction and maintenance of tolerance. Treg cells are decreased in number and show impaired function in preeclampsia, while Th1 cells and cytotoxic T cells are increased, suggesting disruption of the tolerance system. Chronic inflammation is observed in preeclampsia, which could be explained by an impaired function of Treg cells and an increase number of M1 macrophages, Th1 cells, and Th17 cells. In addition, production of agonistic autoantibodies targeting the angiotensin II type 1 receptor (AT1-AA) occurs in preeclampsia due to the decrease of Treg cells and increase of activated B cells. Moreover, the antiangiogenic factor sEng is increased in preeclampsia, and it plays an important role in induction of Th17 cell differentiation and inhibition of Treg cell differentiation by inhibiting TGF-β. 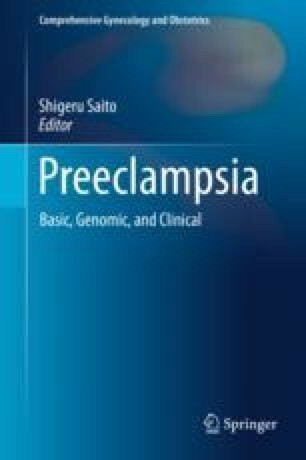 These changes of the immune system seem to be important in the pathophysiology of preeclampsia. Recent studies have shown that immunotherapy can be effective in animal models of preeclampsia, including infusion of Treg or treatment with IL-10, anti-TNF antibody, CTLA-4 agonistic antibody, rituximab, and PDL1-Fc.